A window awning is installed directly above a window on the exterior of a house. It helps keep shade over the window. 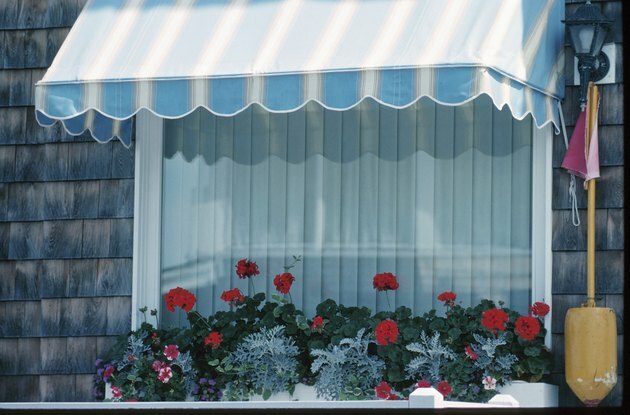 Awnings are typically made with a metal frame and are composed of some type of fabric. The width and projection away from the house will vary depending on the size of window you have. If you want to make a stationary window awning, you can do it with PVC pipe and fabric. You can make a window awning with PVC pipe. Measure the width of the window with a tape measure. Add 4 inches to that measurement. This will allow the PVC pipe to be slightly wider than the window. Measure and mark this same distance on a piece of 2-inch PVC pipe. Cut the pipe to size with a hacksaw. Cut another piece of PVC pipe to the same size. This will be the piece that attaches to the arms coming out from the edge of the window on both sides. Cut two more pieces to 3-foot lengths for the arms of the PVC. This will be how long the projection is from the window. Attach all four of the pieces together with 2-inch, 90 degree elbow pieces. Make a rectangle out of the four pieces. This will be the frame of the awning. Push the frame up against the house a foot above the window. Hold it firmly in place and drill it into the wall with masonry screws. Insert a screw every 6 inches through the PVC and into the wall behind it with a power drill. Lay fabric out on top of the PVC that is installed against the wall. Wrap it around the PVC and staple it down with a staple gun. Insert a staple every 6 inches along the PVC, beginning against the wall and continuing on both sides. Overhang the fabric on the front of the PVC so it drops down by 4 inches. This will add more shade to your window. Staple it in place just as you stapled the rest of the fabric to the PVC.